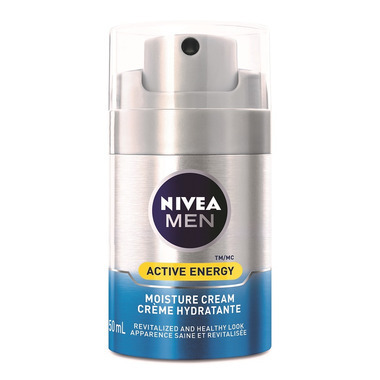 Nivea Men Active Energy Moisture Cream is a moisturizing cream that energizes and hydrates skin without leaving a greasy residue. Enriched with Coenzyme Q10 to revitalize the look of skin. Usage: Apply morning and evening to the face, avoiding the eye area. I tried the Nivea Originals 24hour Moisturizer after already using this Q10 Skin Energy cream for a few years. I will stick with it in the future. Although it is a smaller package and a bit more expensive, I think it works better and I require less product. Really good product at a low cost!!!!!!!! This product is not as good as it can be. Its good for dry to very dry skin as its a fairly greasy deep moisturizer, and I like that it has coenzyme Q10 in it. However, like many "men's" skin products, the scent IS overpowering and slightly irritating, like cheap cologne. Nivea would do well to pass on the 'for men' marketing gimmick & make a scentless version instead. Good moisturizer that has a nice scent that is not overpowering. Like that it has sunscreen it it as well. Leaves my skin soft. I'm very pleased with this moisturizer and very happy that I don't have to spend a fortune to get a good quality moisturizer.